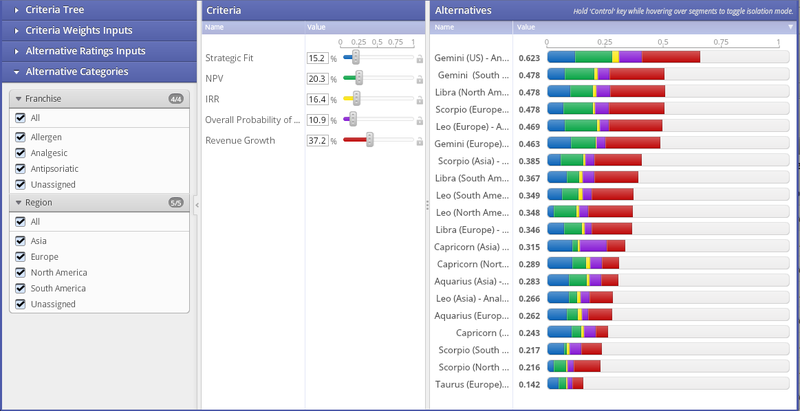 Sensitivity Analysis produces a ranking of alternatives based on Priority Value score. It gives an indication of the relative amount of stakeholder value or benefit derived from whatever ratings inputs and priority weights are chosen. Keep in mind that alternative Priority Value scores fall in a range of 0-1. An individual alternative's Priority Value score is not as relevant as its Priority Value score in relation to other alternatives. This visualization is labeled "Sensitivity Analysis" because it enables you to test “what if” scenarios to see the scoring and ranking impact of changing priority weights and/or ratings inputs. The sensitivity displays from where alternatives draw most of their priorities in terms of the criteria. If you drag the bars to change the criteria weights you will see the resulting impact on the alternatives. If the alternative set is sensitive to changing priorities, then you will see shifts in the most preferred alternatives. A common use of this screen is to drag out a single criterion to 100% of the decision and ask the question, “If this is all we cared about, then which alternative would deliver the greatest value to the organization?” When changing the criteria weights you will notice that, as you increase the weight of a criterion, the other criteria will decrease in priority proportional to their ratio relationships. The software retains those relationships among the criteria as they are manipulated. To return the criteria to their original weights, click the Revert button. Drag the bars and quickly and easily see the effect of your what-if analysis on your weighted set of investments. NOTE: Sensitivity Analysis also provides an excellent mechanism for handling objections to the group’s criteria priorities. When briefing the results of a decision session, stakeholders often question the priority values derived by the group. We can mimic a situation where one criteria is increasing in value to see if it changes the most preferred alternative and what level of change is required to impact the alternatives.